1. Shawl pins and I will never be friends. 2. As much as I love them, shrugs and open-front buttonless cardigans don't love me. More specifically, my petite shoulders. 3. Even though I absolutely love and hoard buttons, I also absolutely loathe sewing them onto my knits. Hence why I have so many unblogged FOs...I just can't get motivated enough to sew on those darn buttons! Not to mention that buttons can make or break the knit. The pressure! Sometimes, I just can't handle it. So I don't. Then, a few years ago I went to Vogue Knitting Live in Seattle and had my very first encounter and introduction to Jūl Designs. I was seriously blown away at not only the no-sew aspect of the gorgeous, innovative, and unconventional leather closures but the fact that you can screw them onto anything - garments, shawls, bags - and you can decide exactly where on these items you want to put them, allowing for some serious creative styling and for me, the perfect accessory to help keep those knits that refuse to stay on my body properly stay in place! I was completely wowed. I've never seen anything like them before! I knew that I needed several of every single style of closure being offered! But alas, my meager budget and the horrible exchange rate at the time wouldn't allow it. 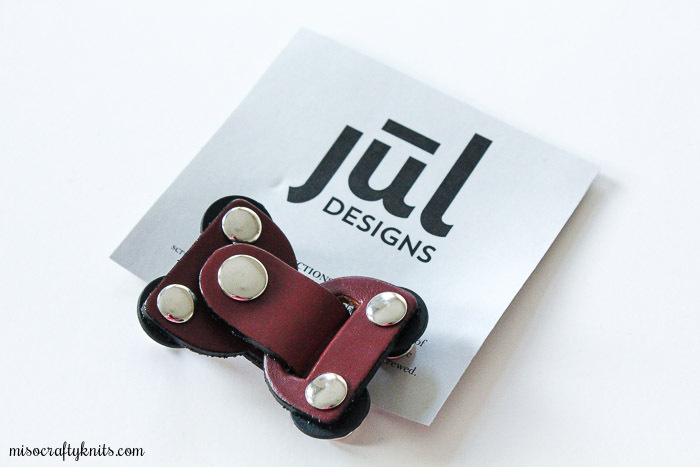 So imagine my sheer delight and excitement when I was asked if I would be interested in the opportunity to review a leather closure by Jūl Designs. Uh...YES!! YES, PLEASE!! You don't have to ask me twice! I was so incredibly excited and in so much awe that when the Lock Toggle Leather Closure in the beautiful Chestnut Brown colour arrived in the mail, I couldn't take it out of its package. Instead, I left it in all its pristine glory in its clear bag on my bedside table and admired it for a few days. I'm weird, I know! When I finally got over my awe, the first thing I did was attach it to the ribbed collar of a fresh-off-the-needles pullover - solely for embellishment purposes! The closure seriously couldn't be more easy to use: you simply unscrew the four "Chicago screws" at each corner of the closure, attach the closure to the right/front side of your garment or accessory by slipping the smooth metal shank between the stitches of the fabric, slide on the circular leather backing disks on the wrong side of the fabric (this ensures the screws don't pull through the stitches of your knitted item and causing the closure to fall off! ), and screw the threaded screws back on. Voilà! If you're a visual learner and want to see these steps in action, check out Jūl Designs Youtube video here and here. The best part: the closure is removable! Meaning you don't have to keep this beauty (or any other Jūl Design closure) on just one knitted item, you can attach it to the cardigan you're wearing today or to the one you're planning on wearing tomorrow, or maybe attach it to the shawl that you finally finished and is currently blocking. Also, because the closure is removable, you can go ahead and wash your knit without worrying about ruining the closure or having to do some magic trick to keep the leather out of the water while your knit soaks. Awesome, right?? As I've said before, the Lock Toggle Leather closure requires no sewing, no commitment, and no pre-planning. So you can knit all those sweaters and not have to worry about buttonhole placement or finding the perfect buttons. I'm SOLD!! I have quite a few sweaters in my sweater chest that still don't have their buttons sewn on or that I have yet to even find buttons for. Way more than I care to admit, actually. But that hasn't stopped me from wearing them! 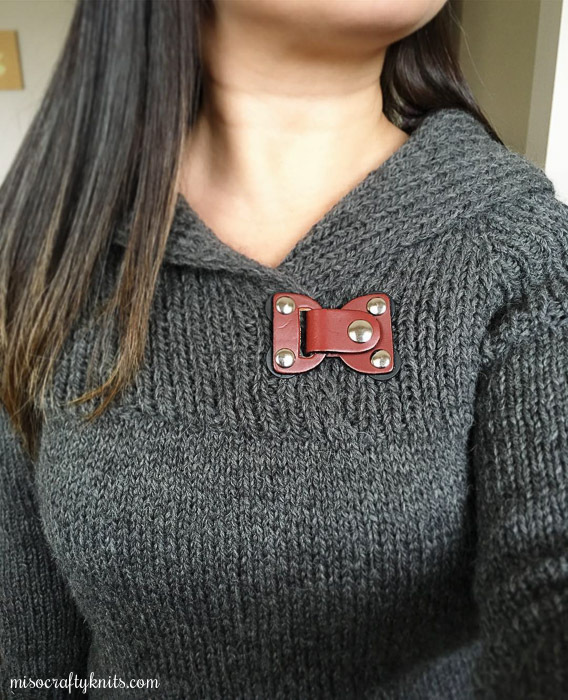 In the past, I've used wooden shawl sticks, kilt pins, and even a couple of button pins to keep my sweaters closed. Now, these all work...for super short periods of time. Generally, I find myself constantly adjusting and fiddling with the sticks and pins, re-arranging my knit, and more often than not cursing the fact that a stitch was pulled too much or that the stick/pin split the yarn in an unsightly manner. None of these issues came up when I used the Lock Toggle Leather Closure. 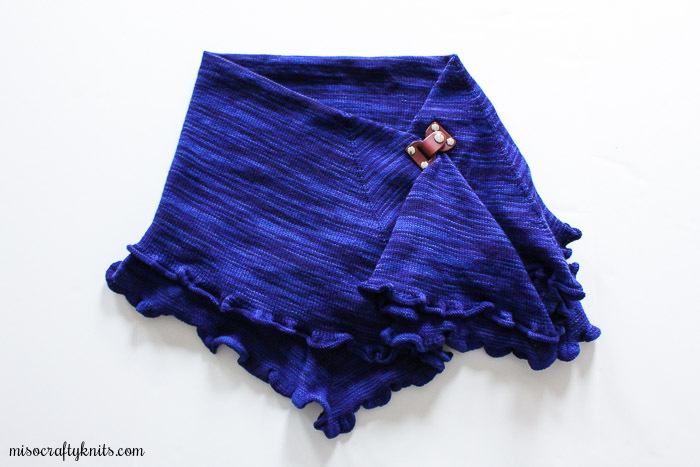 Yes, I re-adjusted knits from time to time but that's more from wear and movement, like straightening your sweater after sitting for a long period of time, not because the shawl stick fell out (again!) and you have to adjust the cardigan so that the fronts match up correctly. I mostly wear this cardigan with the collar flared down and try to have it closed at my bust. The Lock Toggle Leather Closure made this cardigan super easy to wear. Not once during the day that I wore this did I have to re-adjust the fronts! When it was time to take the cardigan off, I didn't have to worry about unscrewing and taking off the closure completely because the actual "lock" snaps onto itself! The tongue on one side of the lock simply slides through the slot on the other side and doubles back on itself and snaps into place. Perfect for when you want to keep the closure attached to a knit for a much longer period of time! For testing purposes, I even tried the closure at the neck (as seen above). Due to the style of the cardigan, the closure allowed the curved hemline to open up beautifully. Just added to my wishlist: two black versions of this closure. I think one at the neck and one at the bust line would make this cardigan look like perfection! This shawl is massive. I rarely, if ever, wear it fully opened, draped over my shoulders. Instead, I like to fold it in half lengthwise and wear it like a scarf. Sometimes I try to wear it like a capelet but find that shawl sticks fall out way too much. With the Lock Toggle Leather Closure, I was able to achieve the capelet look I was going for! I wore the capelet look to a Christmas party and not only did the closure add a nice edgy but modern detail to my outfit but not once did I have to worry about jabbing someone (or myself) unexpectedly when I hugged them and I didn't have to worry about the closure falling off. I got a lot of compliments on the closure, which made me laugh as the colour of the Nuvem is usually the first thing people compliment on! As you can see in the photo above, one side of the closure is going through two layers of lace-weight knit fabric and the other side is going through four layers. The posts on the closure are long enough to go through several layers without the posts looking or feeling like they stick out or are digging into your skin. 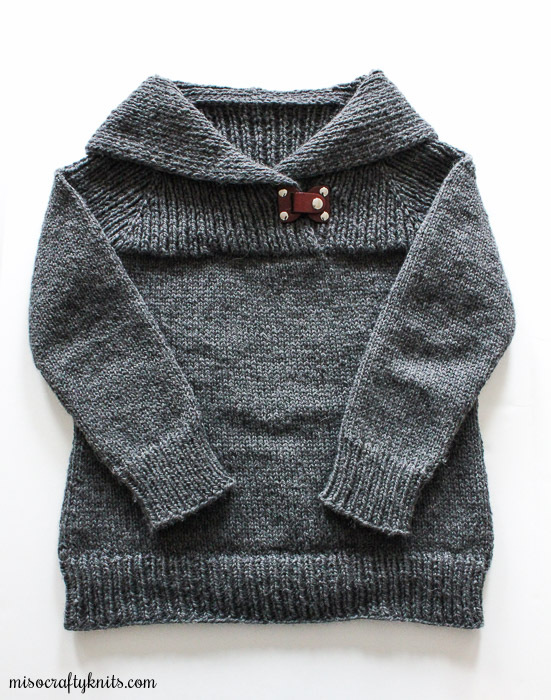 This here is my Fireside Pullover (yes, yes...I haven't blogged about it...yet). Now, technically the collar of this pullover doesn't need a closure of any kind, it looks and wears just fine without one. But sometimes you just want to add a little "oomph" to a knit. Well, let it be known that this closure and this pullover were meant to be worn together! Even more so lately, as it's been insanely cold around here so I re-positioned the closure and moved it a little further up the neck for added warmth and coziness. I wouldn't have been able to do that without this closure! 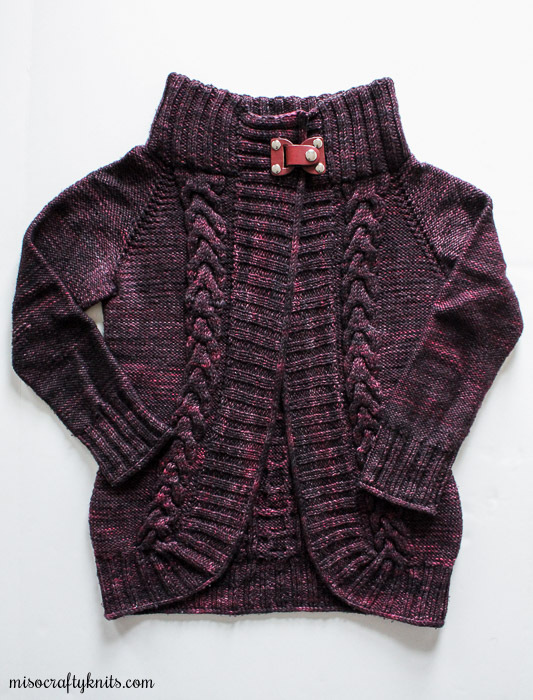 I have a feeling that I will not be able to wear this pullover without a Jūl Designs closure! It's probably quite obvious just how thrilled and in love I am with the Lock Toggle Leather Closure. I think it looks so sleek and modern, versatile and unconventional, yet it's also timeless and functional. I had worried that it might be too bulky or heavy but I've attached this closure to knits of all different yarn weights and I'm happy to report that none of my knits ever gave way to the weight and the closure didn't cause any damage or any unsightly gaping holes in any of the knits. Not even on my Nuvem, which was knit using a laceweight in a slightly loose gauge. The only complaint came from the Kiddo, who could feel the closure whenever I gave him "Momma Bear Hugs". But really, is that a deal breaker of a complaint? I think not. 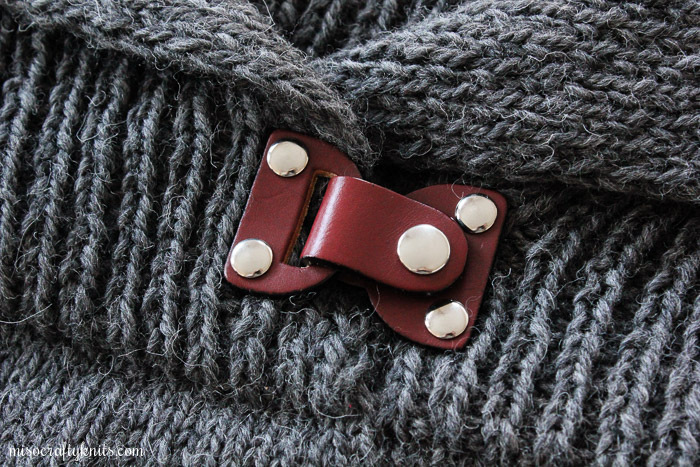 I'm excited to try the Lock Toggle Leather Closure on some of the open-front buttonless cardigans that I have knitted up but rarely wear due to the fact that they constantly slip off my shoulders and I find myself frequently tugging at the fronts, trying to overlap and close the gap. I think with the right placement, the closure can fix my shoulder slippage issue while giving me that little bit of coziness that I seek, as I seem to love cardigans that close at the upper bust. The idea of being able to wear, with minimal fuss, all these cardigans again, absolutely thrills me! I honestly can't recommend this closure (or any other Jūl Designs closure) enough! The leather is nice and thick and you just know it's going to last for years to come. The hardware is heavy duty high quality; the threads won't strip, the posts won't bend or distort, and the snap won't fall off after a few uses. The closure is definitely worth its price! My Jūl Designs wishlist is getting longer and longer! Yes, I'm wearing the backing pieces on the front...I was so excited to try this out that I wasn't paying attention to the details! A huge thank you to Jūl Designs for giving me this opportunity to try out and review this fabulous closure! I know for a fact that I am now a Jūl fan for life and I just know that I'll be picking up a few more screw-in closures in the future. I am not affiliated with the company mentioned in this post. I received no monetary compensation for my review. I was sent a product for review purposes. The wording and opinions I've written are my own and I will not be receiving any commissions from the links provided in this post. Thank you so much for sharing the post.Knitting is a good job.It needs a lot of creativity.It is very difficult also.All the designs you have shared here is really good.The color,styles everything look good.It needs a lots of effort.You are doing a great job.Keep it up.It is always a pleasure to read blogs like this.Keep sharing more post like this.